In the last 12 hours, over 500 arrests were recorded at police stations in Pathanamthitta district -- where the Lord Ayyappa shrine is located -- as well as in Thiruvananthapuram, Kozhikode and Ernakulam. 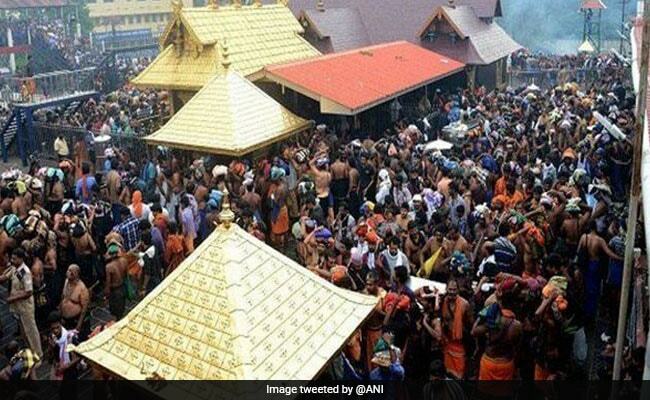 Over 3,345 protestors, who prevented women from entering the Sabarimala temple, have been arrested since October 26 while 517 cases have been registered at various police stations across Kerala, authorities said on Sunday. On Sunday morning, Sabarimala tantri family member and activist Rahul Eashwar was arrested taking the total number of arrests to 3,346. He has been taken to Kochi. Mr Eashwar was arrested after the police received a complaint stating that he had made provocative remarks over the issue at a press conference in Kochi last week. Meanwhile in the last 12 hours, over 500 arrests were recorded at police stations in Pathanamthitta district -- where the Lord Ayyappa shrine is located -- as well as in Thiruvananthapuram, Kozhikode and Ernakulam. So far only 122 are in remand, while others have been released on bail, according to the police. However, Kerala Police chief Loknath Behra has directed that no arrest should be made of those people who protested by taking part in singing hymns and prayers. The arrests have been made for defying the September 28 Supreme Court order that overturned a ban on women of menstrual age (10-50 years) from entering the hilltop temple where celibate deity Lord Ayyappa is worshipped. Defending the arrests, state Communist Party of India - Marxist (CPI-M) Secretary Kodiyeri Balakrishnan on Sunday told the media that this was normal police action when the rule of law is breached. "During the previous Congress-led UDF rule, over four lakh cases were registered against our workers. Is it not natural for the police to act when rules are broken?" asked Balakrishnan. On October 17, the temple opened for the five-day monthly puja. However, the protesters ensured that no women in the barred age group could enter the main hall of the temple until October 22 when the gates closed.